The Bay of Islands, located in the far north of New Zealand, was named by Captain Cook in 1769. Whalers and sealers followed Cook in the late 1700s and missionaries arrived in the early 1800s. A permanent settlement (Russell) was established in the region by at least 1814. Today most historians credit this settlement as being the first European permanent presence in New Zealand, but some argue that the whalers and sealers in Dusky Sound were even a bit earlier. The early residents were whalers, sealers and merchant seamen and they were a rowdy assemblage. Drunkenness, womanizing, murder, suicide, blasphemy, theft, lying and a variety of other misdeeds were common place. Russell was known throughout the oceans of the world as the Hell Hole of the Pacific. Charles Darwin visited and was so appalled that he donated money to build a church to help straighten things out between the local community and the shifting tide of seafarers that washed through the port. A staple food item for the Maori people at the time was the kumara which is usually translated into english as a kind of sweet potato. It is currently believed that this type of sweet potato originated in South America where there is evidence that it had been cultivated for thousands of years. (The presence of the kumara plant in New Zealand is one of the things that has led many scholars to favor theories that say that the Maori people's ultimate origins are to be found in South America.) The Maori kumara was small and required fairly intensive cultivation that kept the entire Maori community tied closely to their potato patches. This did much to shape their way of life. Modern scholars characterize them as living an advanced stone age existence prior to the arrival of Europeans. With the arrival of the whalers and missionaries came all of the accouterments of modern 18th century Europe. These material objects rapidly changed the Maori way of life. Of particular importance were the musket and the American sweet potato. Their introduction resulted in an extended period of brutality on a scale never seen before in the Maori culture. Maori tribes throughout the islands had a long history of conflict, but the requirements of daily life made it impossible to go on the war path for extended periods of time and the primitive nature of their weaponry limited the violence that a given war party could inflict on a neighboring tribe. Inter-communal disputes were frequently settled by hand to hand combat between opposing champions. Because the American sweet potato was larger and easier to grow and store, it provided more flexibility in community organization which in turn resulted in more leisure time for the male component of the community. The musket immediately provided an individual warrior with more kill power. Combined with long festering disagreements between neighbors the result was the Musket Wars of the early 1800s. Thousands of Maori warred with one another for periods of up to a year at a time and sometimes a few Europeans were involved as well. It is estimated that 20,000 people died in these conflicts and another 30,000 were enslaved or displaced. 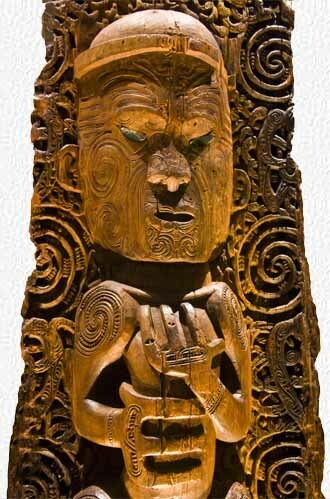 During this period the Maori developed considerable expertise in tactics and strategy that they later employed not against one another but rather against the ever increasing tide of European settlement. The conflicts between settler and native extended from 1843 to 1872 and were referred to at the time as the Maori Wars. Today they are called the Land Wars. The Treaty of Waitangi in 1840 had promised fair treatment for the Maori, but in practice they were frequently pushed off land that they and their ancestors had occupied for centuries. The Maoris fought their various battles well, but the weight of the colonial tide inevitably went against them and they were eventually defeated. As our bus driver said during one of our sightseeing excursions "There was a war - we won - they lost." Today Maori activists continue to resist what they consider to have been European mistreatment, but their principal avenue of attack appears to be through the court system and public opinion not the battlefield. We were interested to see exhibits in various museums throughout New Zealand that attempted to address the issue even handedly. These exhibits all highlighted the legal misunderstandings arising from the Treaty of Waitangi, documented early European and Maori interpersonal problems, and highlighted Maori contributions to the country. The situation seems to us to be analogous to the way in which European settlers interacted with American indigenous peoples during the same period of history.